A seal swims to the shore of Iceland and sheds her sealskin. Emerging from the sea in human form, a Nordic apparition of Aphrodite in the half shell, the selkie arrests the attention of a fisherman who proceeds to steal her protective sealskin in order to marry her. A few years and kids later, the selkie longs for her watery home. Two sets of diagonal train tracks—one heading northwest, one heading northeast—must necessarily intersect at some given point, according to Euclid’s fifth postulate, or the parallel postulate. The discovery of hyperbolic geometry—the negative curvature of a plane—destabilized this truth, knocking it down to theorem status. What if the tracks suddenly veered away before the point of intersection? For two thousand years, Euclid’s fifth postulate was an assumed truth. Imagine a sphere inverting into itself. Push your navel toward your spine. In a past project, Ice Land (2014), I documented the designed calving of ice on silent black and white Super 8 film. In recording, I tossed a four-foot piece of ice off a bridge into the Mississippi River and listened to the resulting boom echo through the river valley as the ice punched through the surface of the river. The bridge acted as a threshold between the built environment and wild space, and the hyperbolic soundscape was the sound wave that travels down river, bowing and flexing the Euclidean plane of human experience. By manipulating the borders between constructed knowledge and wild unknowns, my art seeks to acknowledge that what lies outside experience distorts its very center. 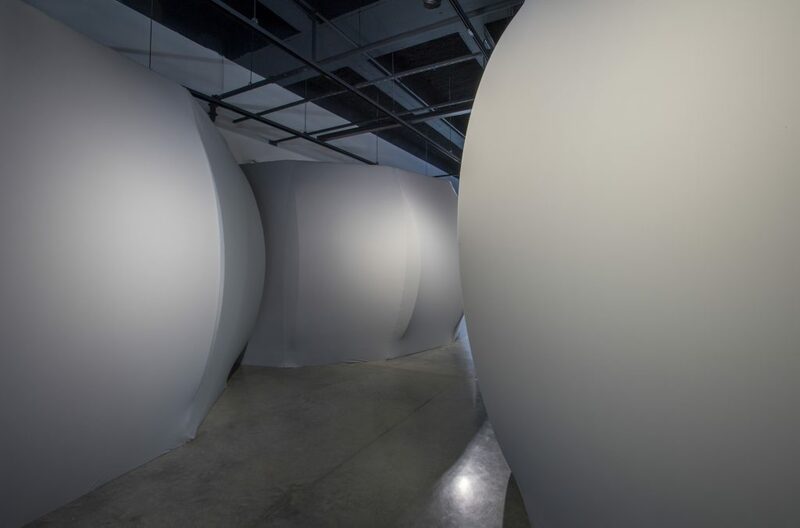 As you press into the parabolic wall of Hyperbolic Soundscape, its positive-bolic (ball-like) curvature turns negative, becomes hyper-bolic or excessively -bolic: a maximization of surface area and infinite parallels. The sound of a pane of glass cracking bends, flexing the once Euclidean plane into the malleable tension of a -bolic plane. Hyperbolic space is generative, forming as it happens in time. We cannot predict what will actually occur. As you move through the space and press against the walls, play the sounds, you contribute to the creation of Hyperbolic Soundscape. No one knows precisely how this soundscape will be composed until it unfolds over the duration of exhibition. 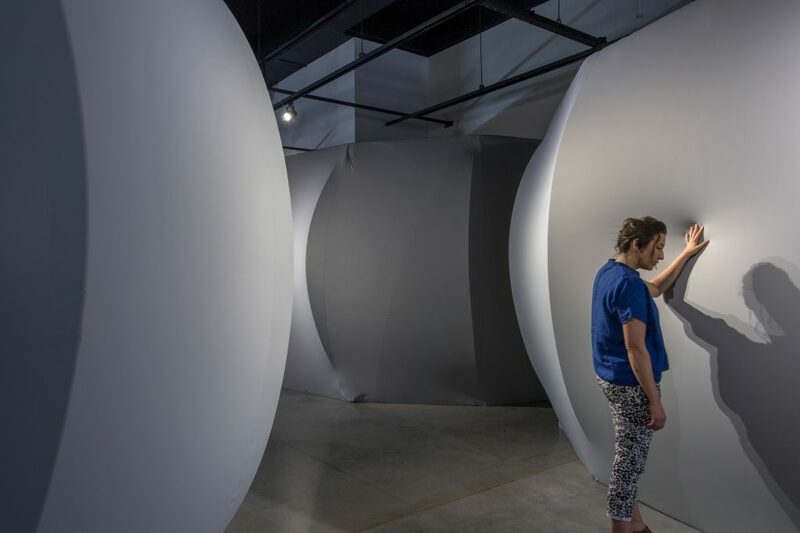 Hyperbolic Soundscape exaggerates the participant’s relationship to space, calling attention to how everyday sensory knowledge is constructed and dissolving the rigidity of assumed truth. 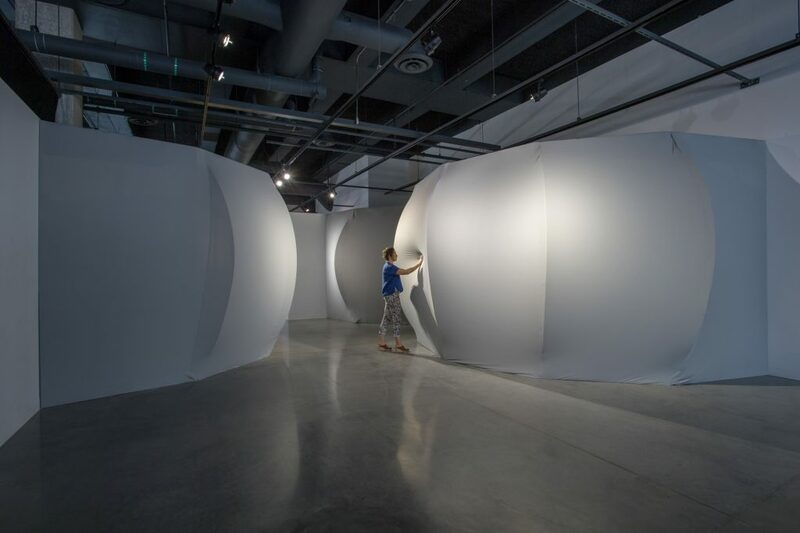 Kelsey Bosch received her BFA from the University of Minnesota – Twin Cities in 2009 and her MFA in media arts from the Minneapolis College of Art and Design in 2016. First inspired by a hike through the Andes, Kelsey has continued to explore natural environments. In 2013, she attended Nes Residency in Skagastrond, Iceland, where her passion for Nordic and polar landscapes emerged. Through her experiences in nature, Kelsey aims to arrive at a truer sense of self, while evoking wonder in the viewer toward specific natural places and inviting discourse on environmental issues.